One of the biggest challenges parents have when chosing healthy food for kids is just coming up with ideas. 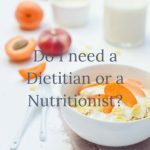 Life is so busy when you have toddlers and kids and keeping them fed with healthy food when you’re out and about can be challenge. 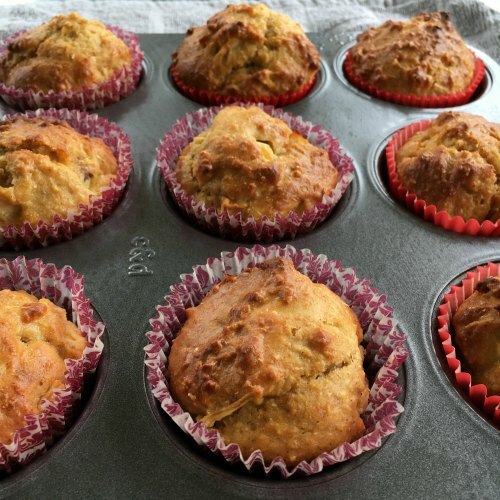 It’s not going to surprise you that as a nutritionist, I’d much prefer that our kids had lovely fresh home-prepared snacks – but as a mum I know this isn’t always going to happen. 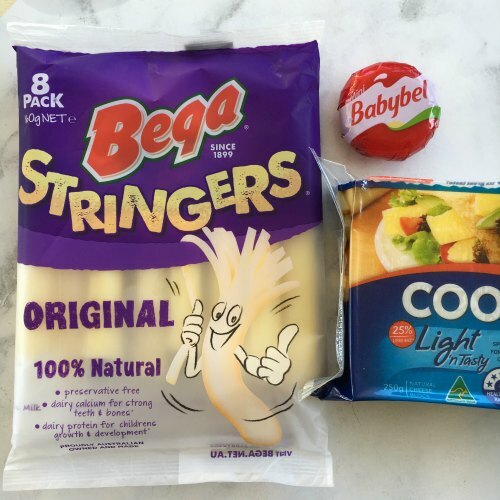 So I’ve made a list of some packaged snacks that meet my high standards and some home-made stuff that is quick and easy to get in a container and thrown in the nappy bag. I’d love to hear if you’ve got some healthy favourites that aren’t on this list, share them in the comments. My top 12 snacks, arranged loosely in order of age appropriateness. 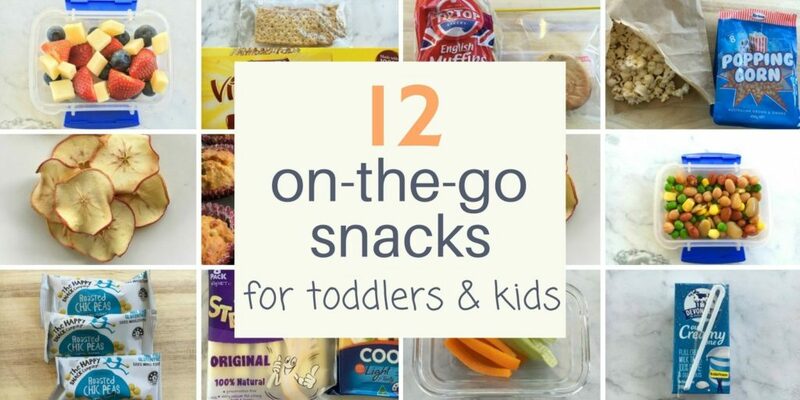 Softer stuff at the start for babies and younger toddlers and harder crunchy snacks for older kids at the end. 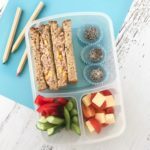 All of these options are nut free so are great lunchbox ideas too. It does not get quicker or easier than a banana, mandarin or kiwi fruit thrown in the bag for later. They’ve got their own wrapper and there’s no waste if it doesn’t get eaten. Kids under 4 only need 1 serve of fruit a day (½ if they’re under 2 years). But they need 2½ serves of veg! It’s a big ask to get this all in at dinner; so spread it throughout the day. 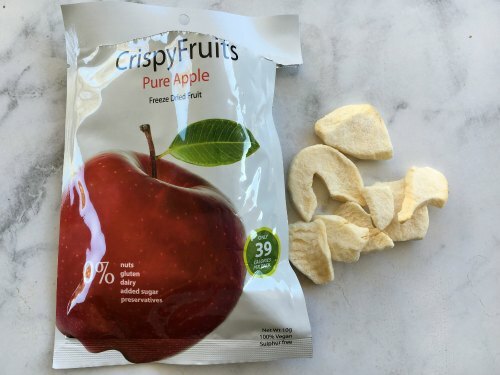 I like showing kids that a snack doesn’t have to be something sweet or a treat. This normalises healthy eating – creating good habits for life. Don’t be scared to introduce veggie sticks to babies and young toddlers – just cook them. As they get older, cook them less and less until they can handle them raw. 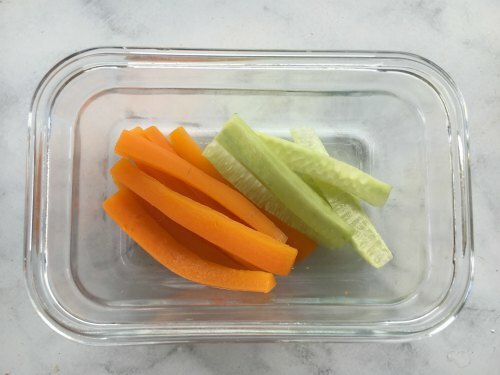 My daughter (13 months) often has the pictured cooked carrot sticks and middle-of-the-cucumber sticks as snacks. She still doesn’t have teeth. When she does, I’ll keep the peel on and cook the carrot a little less and keep the skin on the cucumber. 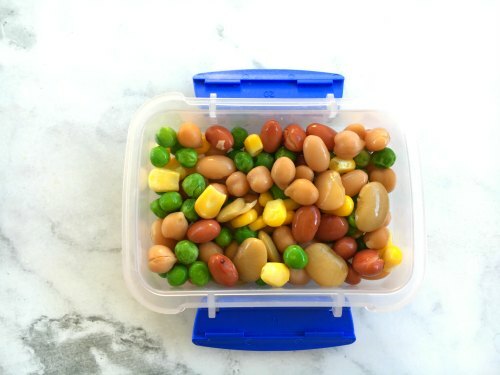 This selection of beans, frozen peas and frozen corn look appealing with their bright colours. Babies get to practice their pincer grip and toddlers will practice independence picking out the ones they like first. Best of all, it’s ready in a flash. Drain and rinse a can of 4 bean mix (look for no added salt) and add some cooked frozen peas and corn. Cook or prep extra veg when you make dinner so that you do have leftover peas and corn, carrot sticks and brocoli florets in a container ready to grab-and-go. 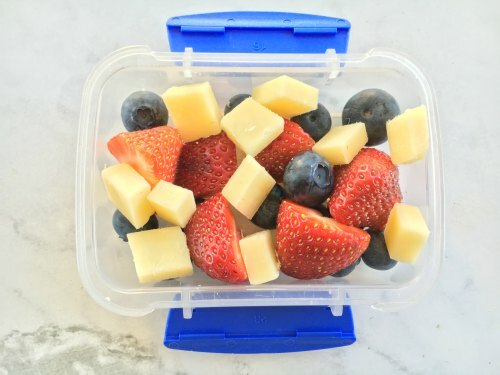 When you do have time to cut up fruit, veg and cheese snack tubs, make 3 days worth. Do some for yourself while you’re at it. Get into the habit of roasting a tray of vegetables when you’ve got dinner in the oven so there’s a plate of veggies in the fridge ready to add to salads, sandwiches or as snacks. Expand your roast veggie horizons – try cubes of beetroot, carrot, zucchini, capsicum and cauliflower florets too. This is how I deal with the space issue when I come home from grocery shopping and my pumpkin and cauliflower won’t fit in the fridge with everything else. I like this combination as a snack should really be a mini meal. A small selection of different fruit keeps things interesting and the cheese is there to add some protein and calcium. Cheese is great for teeth, eating it after a meal or sweet foods helps prevent tooth decay. You could even add some veggies in there too. A couple of butter beans, a cooked carrot stick or a few peas would do. I bet you didn’t think these would make it to my list! Most of the kids’ cheeses in the fridge section really are just cheese. 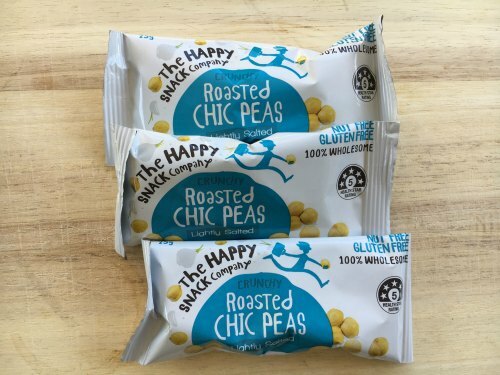 Overpriced, individually packaged and heavily marketed with pester power – but still just cheese. A single stick is 20g so it’s a good portion size. A cube of tasty cheese is just as nutritious as the kids’ varities and a lot cheaper. These cheese stringers are $23.75 a kilo! When the kids just want something that comes in a packet though, these are a healthy option. Be careful of those long life ones in the spreads aisle though; the salt is double that of real cheese and they’re made with cheese, they’re not cheese. Ingredients: Wheat flour, water, mixed fruit, bakers yeast, wheat gluten, sugar, vegetable oil, iodised salt, oat fibre, vinegar, maize polenta, soy flour, mixed spice, raising agent, emulsifiers, preservatives, thiamin, folate. Made with white flour and added sugar, I wouldn’t make these an everyday thing (10g sugar per 100g but mostly from fruit). 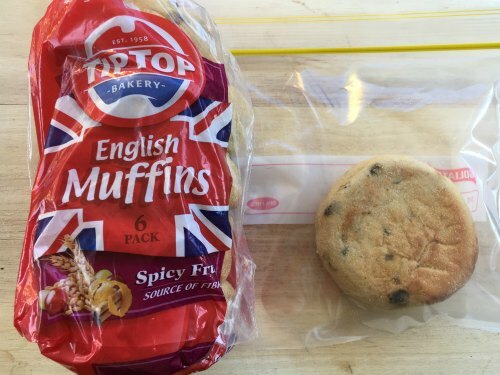 These english muffins are a good source of fibre and fruit version is sweet and appealing too. You could go one better than this and get a whole-grain fruit bread from your local bakery. I love these 200ml UHT milk tetra packs. Decant into a sippy cup for littlies or straight out of the tetra pack for bigger kids. Water and milk are the only recommended drink for kids. Milk has protein and fat too so it will be more filling than water. UHT milk is just as nutritious as fresh milk and there are no other additives. 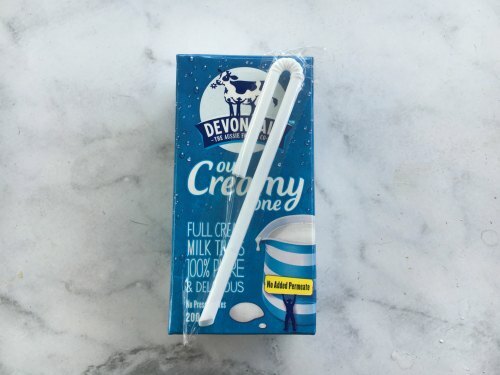 They’re perfect for keeping in the pantry for for the unexpectant out of milk crisis. I keep one in the nappy bag too. Put them in the freezer overnight to use as a drinkable lunchbox ice brick. 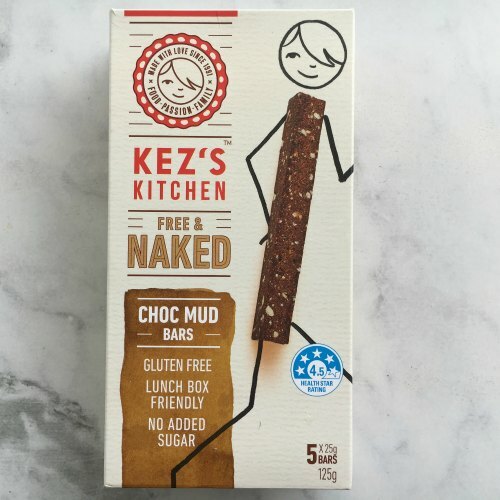 If you must have a fruit bar, these Free & Naked bars by Kez’s Kitchen are the only one’s that I recommend. I rate them better than muesli bars too. The only problem I have is that the flavours oversell them a little. They are really yummy – as a fruit bar. If you were expecting chocolate fudge – not so much. 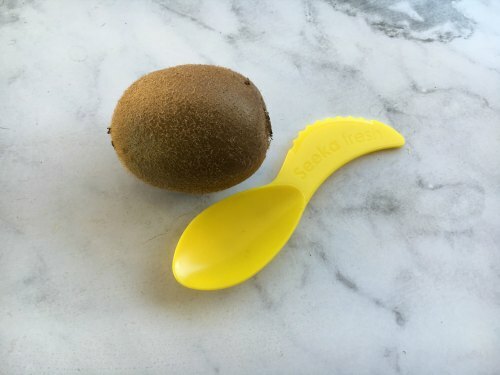 They’re only 25g and not all of that is fruit so you’re probably only getting 1/2 a serve of fruit in a stick plus some good seeds in there too for a little bit of protein and little serve of good fats. Freeze dried space food. These are a lot of fun to eat as the texture is a bit odd. There aren’t any hidden nasties it really is just apple. I wish the skin was still on though. 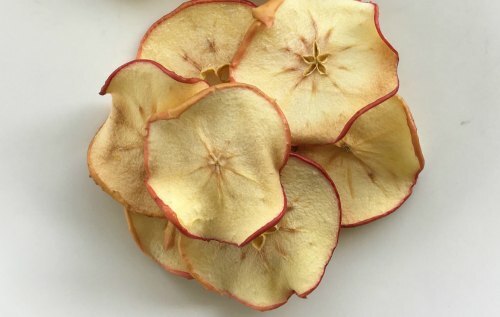 You can make your own even without a food dehydrator. Slice an apple as thinly as you can (or use a mandolin) and cook on wire rack at 100C for about 45min. Then take them out and leave to cool on the rack they’ll crisp up as they cool. If you want to keep the flesh white, soak the slices in some lemon or orange juice while the oven heats up. To count as a serve of carbohydrate get some whole-grains into them with a cracker like Vitawheats, Ryvitas or multigrain Corn Thins. 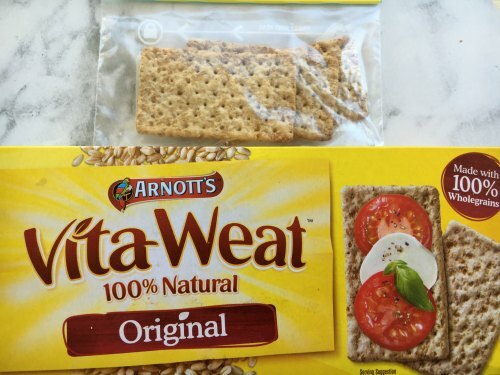 Keep serve sizes small as most crackers have quite a bit of salt added – this is really important for your under 2’s. Ditch the Cruskits, Sao, Salada. They’re just fillers with no fibre and too much oil and salt. Rice crackers are about as nutritious as cardboard. Worse if they’re salted. I really don’t like them. 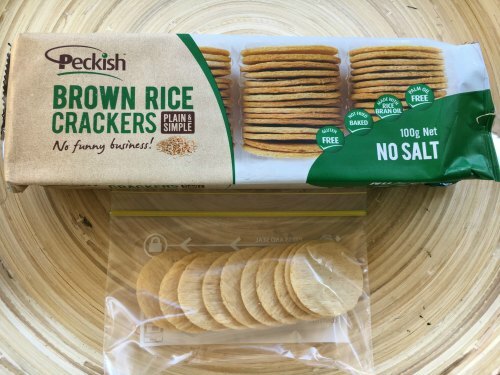 But I get that they’re easy and kids like them and they are better than a lot of other things they could be eating.It you’re looking for a rice cracker, these are the best I’ve found with no added salt. But they’re still just flour and oil (wholemeal flour and rice bran oil, so it could be worse), but they’re not offering many nutrients. Serve crackers with something else like cheese or a veggie dip to make it a more balanced snack. A lot of snack sized packets of popcorn oversell their healthiness. They may be air popped but they’ve still added oil to help all the salt stick. 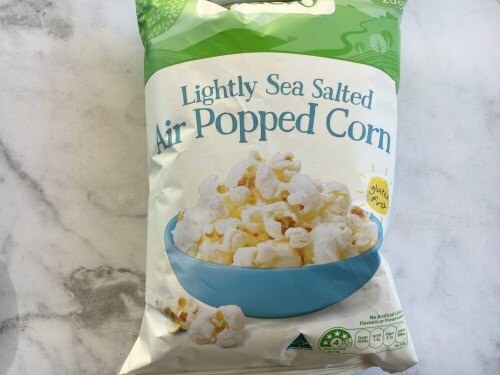 The lowest salt I have found are the Woolworths Macro brand (pictured), but at $1.50 a packet you wouldn’t want to be buying these as a lunch box snack every day. Making your own is a much better option and at $2.15 for a bag of popping corn that will make you 10x the Macro packet it’s a lot cheaper. You’ve probably made a batch of popcorn in the frying pan but have you tried the microwave? Get a brown paper bag (like the ones your mushrooms came home in) put 2 tablespoons of popping corn in, fold over the top two or three times and microwave on high for 2 minutes. 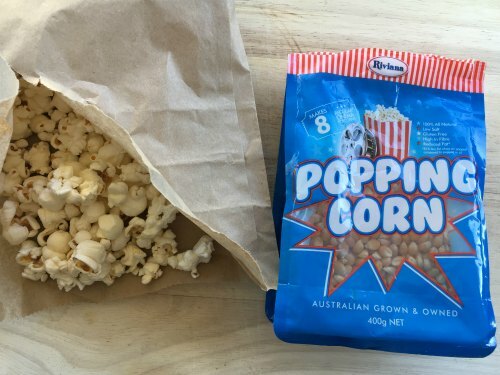 You need to stay close by and when the popping slows down, stop and take it out or the popped kernels will burn. That’s it. Season with your own mix (mexican seasoning is a favourite in our house) shake in the bag and your done! For toddlers, you’ll need to take the popped corn out of the bag before giving it to them as there could be some hard unpopped corn in there too. I think legumes are fabulous foods, they count as vegetable (yes baked beans too!). They’re filling, a good source of fibre and protein. If your kids would turn their noses up at my skittle mix try them roasted with flavouring. You can make your own in a flash too. Next time you’ve got the oven on a high heat (180C-200C), drain a can of chickpeas and spread them over a baking tray. Spray/mist with a little oil and sprinkle over some spices. Cook them for about 40 minutes. Leave them in the oven to cool for maximum crispness. All of the packet snacks were bought from Woolworths and are widely available at most supermarkets. Thanks Sarah, such a handy and realistic guide! Especially love the tip about roasting the chickpeas- who knew?! Can’t wait to try this! Hi Madelaine, I’m so glad you found this post useful. Let me know how they go down when you try them. Thanks for your comment and have a great day!